The latest exhibition by Portuguese-born and Manchester-based installation artist and former architect and ethnographer, on display at a Georgian National Trust country house venue. 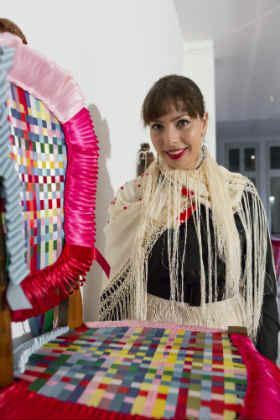 Rodrigues’ art lends an artistic identity to functional objects within the house, such as tables, chairs and chandeliers, by covering or enveloping domestic furniture in silks, ribbons, lace and other woven or knitted fabrics simulating traditional Portuguese female crafts. This entry was posted in Uncategorized and tagged 2015, Cristina Rodrigues, Exhibitions, Portuguese, Portuguese Art, Tatton Park on July 6, 2015 by Clare Hills-Nova.